A friend had a kitchen outlet arc and trip the GFCI. The cover around the outlet is metal and should be grounded. The arc happened when a metal tape measure brushed in front of the outlet. It looks like the arc was between the hot and cover. Could a metal tape in contact with the grounded cover and in front of the hot receptacle cause the arc? I would think that shouldn't happen. FYI, she asked me what happened and my reply was it wanted you to call an electrician. Were the plugged in cord's blades flashed or arced? 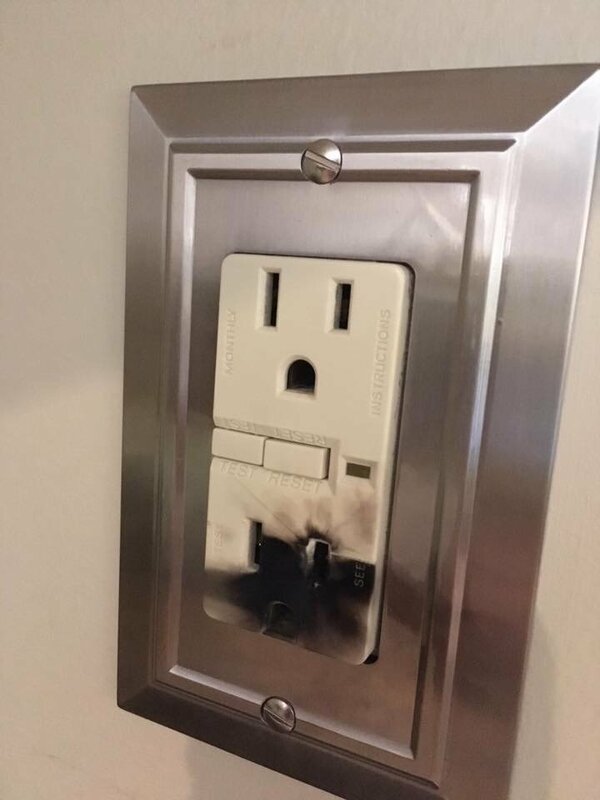 Is the soot coming from the outlet or the plug? visually, it look like what I would expect from a plug blowing up. Was there anything plugged into the outlet? This looks more like a metal tape measure slipped behind a partially plugged in cord and contacted the hot and the neutral-that would most certainly cause this, GFCI or not. Otherwise it seems unlikely-the hot contacts are typically recessed .100 or better behind the face-far too far for 120 V to jump without actually sticking something into the receptacle. We might also consider the size of the tip of the tape measure reaching into the Hot side. One would need to see the size of the tape measure and the end to see if, the end fits in the outlet. Larger 1/2 inch size may not fit and have a problem where as the smaller sizes may fit in the open slot. I read the tape measure part, but did not connect that it was a spring-wound measuring device. Duh. There is no arc pitting on the SS cover. I don't think ii touched it. Had to be a plug in the outlet. The picture implies that the tape diverted the flash downward from the resting points on the blades. If a metal tape measure shorts between hot and safety ground that will trip the GFCI as loop current is diverted to ground instead of returning into neutral. The voltage of only 120VAC is not enough to arc across any appreciable distance without an ionized path, after the first arc is struck the pyrotechnics can last a little longer but the GFCI will trip in mSec. It seems like a freak occurrence for a loose tape measure end to make electrical contact with the line socket lead, "and" faceplate ground but the evidence suggests it did happen. And the GFCI worked to protect the meat puppets. I'll jump in and play the guessing game, too. Most of these measuring tapes have paint and a mylar coating that provides a minimal amount of electrical insulation, but the edge of the tape sees a lot of abrasion so may have exposed metal. I'll guess that something was plugged in, and someone was measuring the length of the wall across or above the outlet. The metal rule of the measuring tape slipped down between the plug and the face of the receptacle. The edge of the tape, which probably had bare metal, contacted the hot and neutral prongs, resulting in an arc flash. (The sharp line across the top of the holes suggests this.) This alone would not have tripped the GFCI, as the current between hot and neutral would still be balanced. Also, if the initial short was to ground, the GFCI may have tripped before the current was sufficient to create an arc flash. However, the initial arc flash melted the coating from the rule, exposing more bare metal. After the initial arc flash, continuing motion of the tape (or reaction of personnel) caused the bare metal to contact the cover plate while the edge of the rule was still contacting either the hot or neutral prongs, resulting in a current imbalance between hot and neutral that tripped the GFCI. Yes, it could happen in a properly wired outlet. Something similar happened to me when I was about 6 years old. I was playing, hanging metal coat hangers on an electrical cord that was draped from a receptacle to a table lamp. I then hung a coat hanger on the plug, where it promptly fell into the gap between the plug and the face of the receptacle, causing a short circuit, an arc flash, and a tripped breaker. (This was not a GFCI protected circuit.) I was a fortunate child, and suffered no injury. I'm not buying the tape measure scenario. How could you possibly get the metal tip of a tape into the receptacle far enough AND keep contact with the plate to get that kind of spark damage? The plastic on the receptacle "hot" slot is a bit melted. That's a lot of spark damage! Where is the damage on the plate that would correspond to the contact location for a direct hot/ground short? If the tape crossed the neutral and hot of a partially exposed plug, the damage would look different, IMHO. Looks like something was plugged in and had a hot/ground short. Assuming the GFCI was functioning properly, a hot-ground short should have tripped the GFCI-and typically these react at least 5-6 times faster than a circuit breaker. It would surprise me to see this much arcing from a GFCI protected fault-though I still find myself surprised quite often.